4000 protest Trump’s plans to slash Bear’s Ears and Grand Staircase-Escalante | Fight Back! 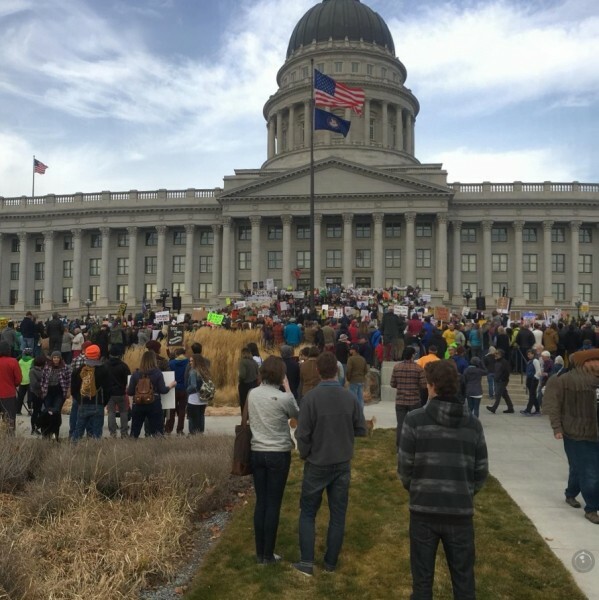 Salt Lake City, UT - Over 4000 people gathered in protest Dec. 2, on the stairs of the Utah State Capitol Building. They gathered in solidarity with the indigenous tribes, and in preparation of Trump’s visit on Dec. 4, when he is expected to announce the significant shrinking of two national monuments located in southern Utah; Bears Ears and Grand Staircase-Escalante. The rally was hosted by 16 different groups, mainly environmental non-profits, and indigenous groups such as PANDOS and Utah Diné Bikéyah. The event was preceded by a drum circle and dances. Bears Ears was created by executive order under President Obama less than a year ago in 2016. Bears Ears is significant in that it is managed not only by the Bureau of Land Management and the U.S. Forest Service, but also by a coalition of the Navajo Nation, Hopi Tribe, Ute Mountain Ute Tribe, Pueblo of Zuni, and the Ute Indian Tribe. The members of this coalition are not just managing public land, they are managing sacred land. Some people, notably Orrin Hatch, the senior senator for Utah, support the shrinking of these and more national monuments to make way for oil drilling. We must not let this be framed as simply a states’ rights vs. big government issue. And we must also resist the temptation to frame it only as an environmental issue. These lands do not only support the protection of natural resources, but they also support the protection of indigenous culture, which has been under attack since the first conquerors arrived on this continent. Trump cares nothing for indigenous people and will continue to disregard indigenous issues by shrinking these national monuments in Utah. As we stood on the steps of the capitol on Friday, we will protest again on Monday. We will show Trump and his administration that we will fight in solidarity with indigenous peoples and that we will fight to protect the preservation of natural resources. Let us continue this struggle against the forces that continue to oppress indigenous people and attack the environment.